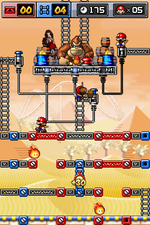 Sandstorm Steps is the fifth attraction in Mario vs Donkey Kong: Mini-Land Mayhem!. It is, as its name implies, a desert-themed attraction. Dunes, pyramids and a roller coaster can be seen in the background of the levels. 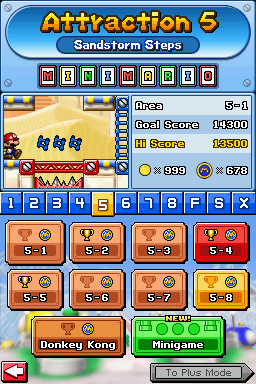 This level introduces the use of movable blue ladders. The player can create those by drawing a straight line between a blue rivet and another. Enemies here include Fireballs, Shy Guys and Capture Kongs. A new mini, called Mini Donkey Kong, makes its first appearance in this level. It has to be rescued in 5-4, along with a Mini Toad and a Mini Peach. In the Plus Mode, a Mini Toad Capsule is replaced with a Mini Pauline capsule. During their fifth encounter with Donkey Kong, the Mini Marios must use girders and blue ladders to reach a switch near DK, and press it to zap him. As for Donkey Kong, he attacks by slamming the ground to cause Fireballs to come out from two Oil barrels near him and attack the Mini Marios. Once defeated, he takes Pauline and flees to the sixth attraction. This page was last edited on March 27, 2018, at 10:31.